"This is the crucial TCM chart that is so important to understand. It shows a "mixture sweep," from rich to lean, left to right." I really enjoyed flying with Chalkie and learning from his experiences and knowledge. We are privileged to have a person like him available and should use this to the benefit of all. I thought it would be great if this e mail could be published on the RV web for all to read. Most pilots make these mistakes because of being taught incorrectly or for some other reason. Whilst surfing the net for John Deakin's articles for Garth, I read a few more... If you want some good info on almost anything aviation go to www.avweb.com register (free) then use the search window for 'Pelican's Perch' then click on Index and all his articles will be listed in descending order. Some "must reads" are... #8, 15 and 18. Flying with Dolph this weekend in the RV-10 with a decent engine monitor vindicated Deakin's theories. The engine runs well at 40 to 50F LOP (Lean of Peak) but you do have to lean slowly, incrementally, to allow the great heat sink of an engine to stabilise. An interesting thing I noted was that with 22" MP set for cruise and mixture leaned to 40F LOP, then with MP reduced for descent, the EGT's illuminated amber (indicating "too lean") which was "corrected" by advancing the mixture. However one descent was done with the EGT indication in "Lean Mode" and this showed the EGT's at -99F (the maximum reading) and the engine still ran smoothly! It took quite a bit of richer mixture just to get the EGT to move away from -99F, so the engine was very lean, not producing much power, and still running smoothly. The fact is that ALL spark-fired, fixed-timing, gasoline-driven, internal-combustion engines are the same when it comes to the combustion event! From your lawn mower to the giant radials of yesteryear, they all act the same. Lean from full rich (usually about 250ºF ROP), and EGT, CHT, ICP (Internal Combustion Pressure), HP, and HP per gallon ALL rise, at first. HP will peak FIRST, at about 80ºF ROP and then start falling, then the CHT and ICP peak at about 40ºF ROP, and start falling, then peak EGT occurs, and starts falling. On the lean side of peak EGT, all those parameters continue falling, then at about 40ºF LOP, HP per gallon peaks, and begins to fall. From there, it's downhill all the way for all parameters, until the engine quits from lack of fuel. If you run ANY of these engines at about 80ºF ROP, you will get the most HP that can be had at that MP and RPM. 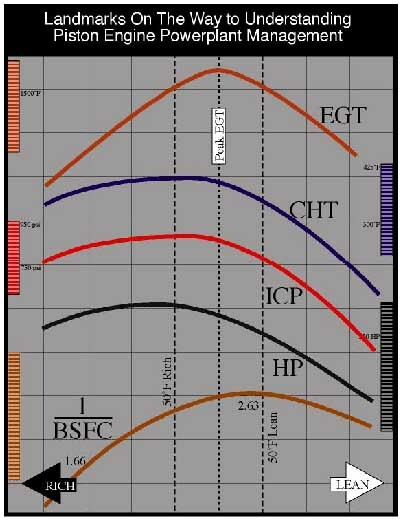 If you run it at 40ºF ROP, you will see the hottest CHT and the highest ICP, at peak you'll see the highest EGT (of course), and at 40ºF LOP, you'll get the most HP per gallon. The laws of physics don't change with the label that says "Textron Lycoming" or "Teledyne Continental," or "Beech," or "Piper." OWT (Old Wives Tale) "Excessive leaning under high power conditions can cause detonation and/or pre-ignition and possible engine damage." No. NO. NO! BADLY SAID! Almost everyone falls for this fundamental flaw in logic! If you run an engine at 40ºF ROP, and add power until detonation actually begins, then moving the mixture in EITHER DIRECTION will stop the detonation! The higher the power setting, the FURTHER from 40ºF ROP (in either direction) you must run to prevent detonation. If you are operating on the lean side of peak EGT and your CHTs get too high (380°F to 400°F or more), you are "too rich" and need to lean it a bit. Here it gets a bit more confusing, just read this paragraph a few times and digest... Here he is talking about making power and not considering economy and entering the area where an engine is susceptible to detonation. Normally aspirated engines are not prone to detonation below 60 to 65% power. Take an engine set up at 50 ROP (rich of peak). Is it "too rich" or "too lean"? We cannot say, without knowing what else is going on. At any power setting above about 60 or 65%, 50 ROP is BOTH "too rich," and "too lean," in that it is the worst possible mixture setting for the engine, and moving the mixture EITHER way will improve things. On the other hand, at about 9,000 feet and above, with no turbo, 50 to 80 ROP is an EXCELLENT mixture setting, for it will produce just about the maximum possible power, and it won't overheat anything at and above that altitude. You NEED 50 to 80 ROP up there! But 50 to 80 ROP and full power at sea level will destroy your engine. Have a look at his articles, you might need a month's leave as there is a lot of good info there. Is he perfect? I guess not, but he has a great amount of experience in many aircraft and does do a lot of research.